Contributor Debbie Marks volunteers and fosters dogs for the Blind Dog Rescue Alliance (BDRA), a Grey Muzzle grantee. A grant from The Grey Muzzle Organization helps BDRA provide medical care for permanent fosters, including some of Debbie's past and current hospice foster dogs. On the day I write this, it is my summer vacation. I’m a teacher, and when my students want to distract me, they ask about my dogs. When I reflect upon the school year ahead, I wonder if my new students will figure that out. I realize I use some of the same language with my students as I do with my dogs. It works for both. I currently have six dogs here. Watson, a Schnauzer, Tiki, a Pomeranian/ Chihuahua, and CC, a Chihuahua, are former Blind Dog Rescue Alliance foster dogs whom I've adopted. Grayson, an Australian Shepherd Mix, is a fairly new Blind Dog Rescue Alliance foster dog who is currently up for adoption (and who I will adopt a few weeks from now), and two, Kimi and Claire, are Blind Dog Rescue Alliance Forever Fosters on comfort/hospice care, most generously helped by a Grey Muzzle Organization grant. My days start out very early, as I wake up around 3:30 or 4:00 am and head downstairs to check on Kimi. Kimi potties around then, and I try to catch her as quickly as possible so that she doesn't track her poop around or go back to sleep in anything but her bed. She does not wear diapers because she urinates more than once overnight, and it is tough on her tender skin. During the school year, Kimi and I were really in sync. Sometimes I'd come down when she'd just begun to potty! But during the summer, for some reason, I can't seem to catch her in the act. Luckily, I am one of those people who can go back to sleep after waking, and so every morning after cleaning Kimi and changing her wee wee pads, I head back upstairs and sleep for a few more hours. After waking a second time, I notice that Claire's left eye is goopy. Claire has a chronic issue with this eye, and I need to start her on eye drops, but want to run it by our vet first. I call the office after they open. Sometimes, the receptionists who answer the phone ask if you're having an emergency. After my reply of one word, "No,” she says, "Oh, Debbie, hi, we'll be right with you." She recognizes my voice as quickly as my family and friends. I probably call there more often. All of the dogs here are older, and almost all are on medication. I had to make a chart that I taped to the kitchen cabinet to help me remember who gets what when. Kimi hates her eye drops, and I feel badly that I have to upset her twice a day. Because it’s vacation, I’m able to spend more time at home. The dogs sleep much of the day, and I love the quiet time. Grayson, my new completely blind foster, has been having trouble learning his way around the downstairs, and I’m encouraged today as he finally goes to the back door that leads to the yard all by himself! He’s also learning “step” and “watch.” He is an amazing foster, gentle and respectful to the other dogs here, and has not had one accident in the house. I know how lucky I am to have him here. Later, I'm lounging around the house in a t-shirt and sweats, and decide to give Kimi's x-pen a good scrubbing. I've got Kimi in my arms when the doorbell rings. 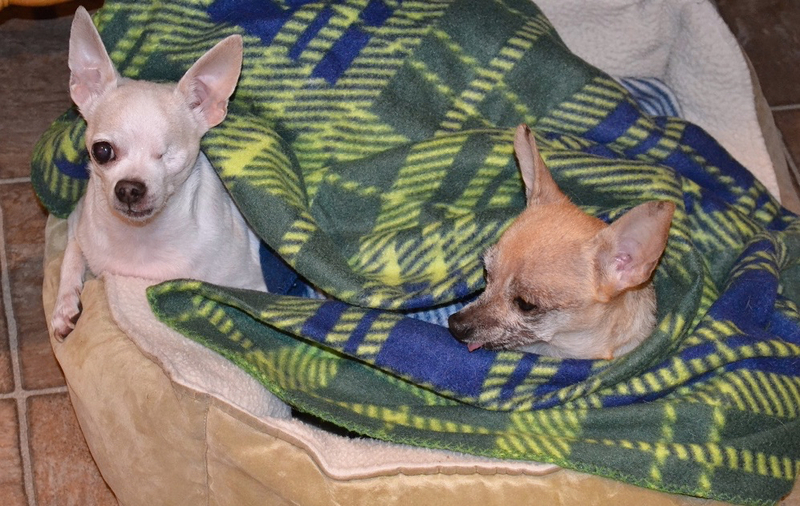 CC and Claire, the typical Chihuahuas that they are, begin barking. A lot. I look out the window, and I can see it's the very responsible young man who mows my lawn in the summer. In one of those small world coincidences, his mom is the office manager of my vet's office. I run upstairs to put on a sweatshirt. Whoops, I still have Kimi in my arms, so I put her down first. Sweatshirt on, I run back down the stairs and head to the door. CC and Claire are continuing their chorus. Out of the corner of my eye, I see Grayson starting to head upstairs. I didn't put the gate back when I came down with my sweatshirt. I run back up the stairs to catch Grayson before he goes all the way up, and I help him back down. The doorbell rings again. I tell CC and Claire to be quiet (even though inside, I’m always delighted that Claire, a former hoarder victim, is as feisty as ever), and I finally make it to the door. He tells me he will be skipping a week, and explains that it is because the lawn is too short. I tell him I understand, and thank him for stopping by. OK, what was I doing? Oh, yes, cleaning Kimi's x-pen. I go back to her x-pen. She isn't there. Where's Kimi? Panic for a few seconds, but then I remember I put her down elsewhere. There she is!! Kimi's x-pen cleaned, I take a glance in the mirror in the den as I walk by. My sweatshirt is on inside out. I settle on the couch with a good book, and Watson and Grayson join me, one on each side. Everybody starts to wake up around the time I’d normally come home from school, and I’ve worked hard to try to keep them on the same schedule. I take everybody outside. Blind dogs never fail to surprise me with their ability to navigate, and my dogs know my home and yard so well that friends don’t believe they’re blind. My close friend and colleague calls and asks me to go shopping, but I decide to stay home. Kimi will be pooping soon. She tells me I’m the only one she knows who makes plans according to when their dogs poop. I’m sure that’s true. I give medication every 12 hours, and it’s now dinner time, so evening medication is due. After dinner, we all go out. My small yard is fenced, and they love to walk around and smell. I sometimes follow Tiki around as he is a poop eater, and can amazingly find even the smallest piece that I missed when I was cleaning the yard. We go out once more before bed, and then head upstairs for the night. Watson is the only one who can go up the stairs by himself, and with Grayson and Kimi sleeping downstairs, it takes me only two trips to carry CC, Claire, and Tiki upstairs and get them tucked in for the night. Claire has one tooth and sometimes her tongue doesn’t go where she wants it to, but tonight she is successful in giving me a kiss. There is no place in the world I would rather be. For updates on Debbie Marks's dogs, visit the Facebook page set up in honor of her first hospice foster, Leo. You can read about Blind Dog Rescue Alliance, caring for a blind dog, as well as more of Claire's story in Debbie's post: "Blind Dogs See With Their Hearts" and "Why I Love My Hospice Foster Dogs." The Grey Muzzle Organization improves the lives of at-risk senior dogs by providing funding and resources to animal shelters, rescue organizations, sanctuaries, and other nonprofit groups nationwide. Visit Who We Help for additional information about The Grey Muzzle Organization's grant recipients, including Blind Dog Rescue Alliance. About the Contributor: Debbie Marks is a reading teacher at an elementary school in upstate New York. While she has been rescuing dogs for only 6 years, she knows that this and teaching children are her passions. True to her dream, she has adopted and fostered senior dogs with medical needs ever since she signed her house papers. She has been a volunteer with the Blind Dog Rescue Alliance since 2011 and is thrilled to have found such a wonderful and caring group of people who feel the same way.